I don’t mean to brag, but I have THE BEST neighbors. Aside from the fact that they’re all, miraculously (because it’s a condo, not a co-op, so existing owners have no sign off on who buys in to the building) friendly, nice, awesome people, they are all so supportive of A Clean Bake. Whether through the luck of proximity or simply baking fate, they are all hungry and receptive taste testers, recipe makers, and idea-comer-upers-with. Or, at least they would be that last thing, if it weren’t a designation I just made up on the spot (betcha couldn’t tell…). I wouldn’t trade them for anything, but unfortunately, sometimes, we don’t have a choice: two of them are, for reasons inexplicable to me in the humidity and Zika-riddled-mosquito-infested dog days of summer, moving to Florida soon and, even though no one signed off on this development either, we are nonetheless duty-bound to give them the send off of all send offs. So that’s what I’ll be doing this weekend. What about you? We’ll miss our neighbors horribly, but as soon as I emerge from the haze of depression and abandonment issues that their departure will inevitable cause, I’m grateful that I’ll have a house full of amazing neighbors to commiserate with. We’ll probably drown our sorrows in a vat of raw cookie dough because, frankly, the outgoing neighbors have the best taste in wine of anyone in the house and we’d never insult them by switching to the cheap stuff the minute they’re out the door. Also, I probably shouldn’t be mainlining wine right now, but I can eat cookie dough until my pant buttons pop off. Only – sike! – my pants no longer have buttons because I look like I swallowed a watermelon and am therefore a newly converted believer in jeggings (“maternity jeans”, whatever), and the combination of stretchy pants and third-trimester pregnancy make eating raw cookie dough to your heart’s content totally socially acceptable! Actually, in my world, it’s always socially acceptable, but when you can’t drink wine and miss your awesome neighbors, it’s more encouraged than acceptable, wouldn’t you say? Anyway, where was I going with this? Oh yes. So, I actually can’t take credit for this idea at all. 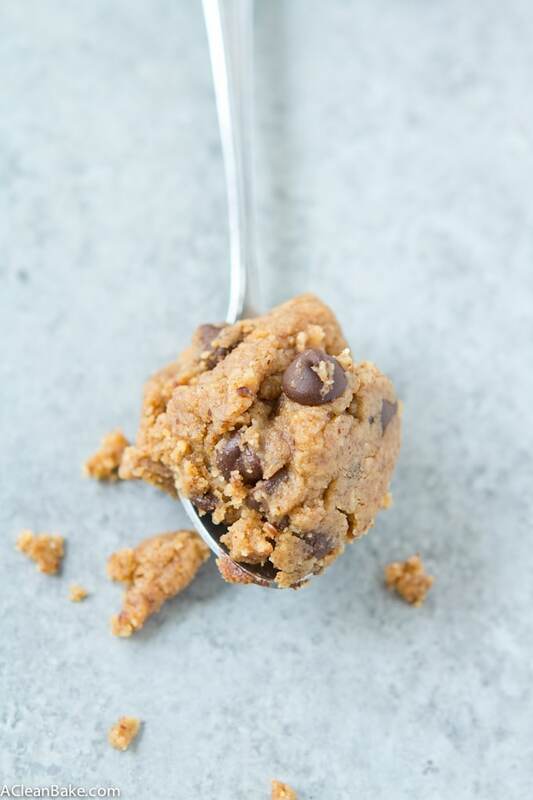 Another neighbor – not one of the moving ones – texted me last week to ask if she could just take the egg out of my grain free chocolate chip cookie recipe so that she could….wait for it… just eat the dough straight. 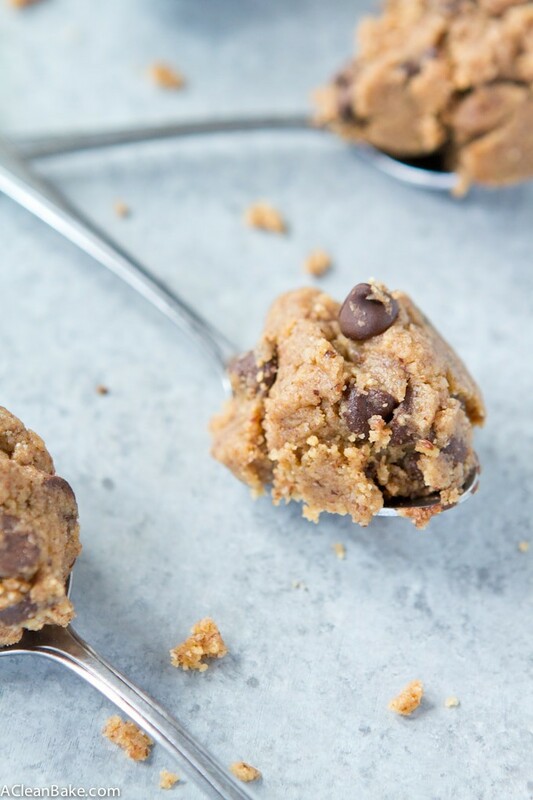 Edible cookie dough: OMFG genius. So we both set to tinkering and it turned out that the original recipes can simply be eaten raw (without the egg) and it’s good, but why settle for good when you can have great? Last weekend, I made an alarming volume of raw cookie dough and finally arrived at a formula that I think – no, I know – you’re really going to like. So grab a spoon and dig in! 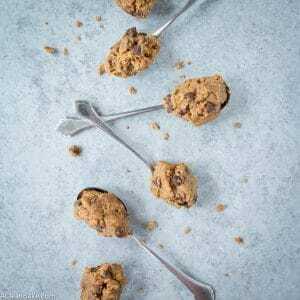 This egg free edible cookie dough is good enough to eat with a spoon - and lucky for you, it is safe to dig in! Made with only wholesome ingredients. In a large mixing bowl, whisk together the dry ingredients (coconut flour through salt). Set aside. You may need less coconut flour or none at all, depending on how oily your nut butter is. For example, if you’re using a new jar of nut butter, the butter from the top will be very oily and you’ll need all of the coconut flour that the recipe calls for. But if you’re using the last nut butter in the jar, there will be a lot less oil in it and you will need less, or no, coconut flour. If you're unsure, start with 2 Tablespoons of coconut flour, and then add more if you need it after the wet and dry ingredients are mixed (before you fold in the chocolate). If you are making this several hours in advance, the coconut flour soaks up a lot of the moisture and it might become a little dryer/crumblier. If you do not want this consistency, skip the coconut flour and chocolate chips when making the recipe, refrigerate until ready to eat, bring the dough back to room temp, then stir in the coconut flour and fold in the chocolate chips before serving. YOU ARE A GENIUS! I need this in my life. So sorry to hear that your neighbors are moving, but hopefully the new ones won’t be too loud or have a bad taste in wine. 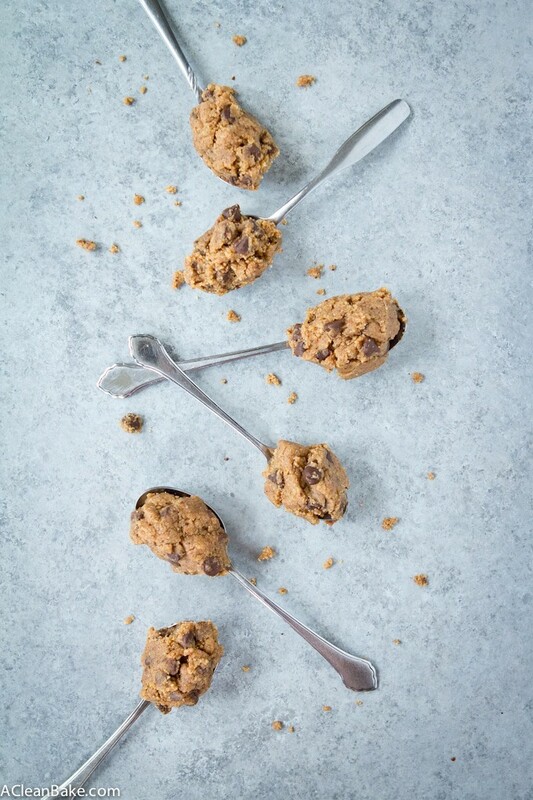 And there is no doubt that they won’t adore edible cookie dough, because… who doesn’t?! Fabulous! My 12 year-old even loved it! Wonderful! I am so thrilled to hear it, Connie!